are you talking about the very awesome red crystal dragon from SOD? if yes, it's a great idea to make it with magma dragon model! Edited by InfernoX880 at 17:03, 22 Dec 2007. Yeah, I knew it'd look too much like a Magma Dragon. I'll need you all to bear with me though as this is my first texture mod and I'm only learning of all the wonderful features of editing . I likewise believe that it needs more changes, but not so much in color anymore. As for the one crystal resource every day, that's what I have in mind, but doesn't that mean I have to program such an ability first? Doesn't sound too hard, assuming I can just take the Taxpayer ability and change a few things. That is a problem though. I keep thinking of the textures but have no idea what abilities to give it. Warlore suggested Prismatic Breath and I second that because if there is no breath attack, then the animation when it attacks will be very akward. Enraged is a likely extra. Now I don't know if I can fit this creature into a town, but how would everyone feel if I made this one of the Fire Dragon upgrades? Still, that gives Crystal Dragons a bad name as underpowered Tier 7 creatures. I would love for this creature to be usable by factions in ways other than having to convert the neutral creature to your side. Any ideas anyone? Yes, I know that much. Sfidanza gave me the link to some neutral dwellings thing, but I haven't checked it out yet. If the above texture is fine (which I think it is), I'm going to get started on all the other stuff maybe today. Problem is I will need a LOT of help in the events to come. Still, I'll enjoy diong all the stats and costs, as well as abilities then coloring the icon in. Edited by Lordi at 19:17, 22 Dec 2007. For any help you need on this topic, you can just post your questions here, since there is a dedicated thread already. I think your next move (if you did not do that already), is to edit the stats, abilities and texts (just to see how it works, even if it's not final). you can follow the rest of the visuals from there (including icons locations). I guess you found those already when editing, but I think I should make sure, as these 2 files are the basis for the rest of your plan. I just want to make sure of this. I shoud base all the stats, costs, and everything based on the original Magma Dragon from whence it came, but then save it under a diferent name so as not to affect the original Magma Dragon but rather create a whole new creature. BTW, I just want to know if everyone is okay with the most recent picture of the Crystal Dragon. There will be one more change to its, but thats just going to have to wait for the mod to come out. looks a little too pinky i think. Edited by sfidanza at 20:48, 23 Dec 2007. .xdb files are simple xml files, and I refer to this one as the <Creature> file because that's what its root node is. Moreover, any link to it from another .xdb file has to give the XPath to the root node, namely "Cyclop1.xdb#xpointer(/Creature)". When adding a new texture, always start from a <Texture> file of a similar dds (creature icon file, creature 3D model texture, ...). This way, you will have the correct values in most of the nodes, and the correct format. Set the DestName to the correct path, and the width and height to the correct values if needed. The last 2 are not used for the creatures. They are for the heroes, but this is another topic. Of course, the creatures also have an animation on the adventure map, but it is specified in the <AdvMapMonsterShared> file, as we'll see below. As we can't edit the skeleton or geometry, I'll only describe briefly these files, to say that both link to their resource by its <uid>. The Cyclop's skeleton resource uid, for instance, is 8D37EE52-4817-4FAC-93C1-ABFF1A8AB71D. Geometry links to 2 <uid> resources, one for the geometry itself in /bin/Geometries/, the other for the AIGeometry in /bin/AIGeometries. If you make your creature based on an existing creature already in the game, you don't need to duplicate the resource files anyway. This is the set of available animations for the creature, where each anim keyword (move, idle00, attack00, ...) is linked to its <BasicSkelAnim> file. * <MovementSpeed> specifies how much distance is walked in one animation loop. It is tied to the <uid> and shouldn't be changed. That was pretty obvious. In H5/HoF, there used to be 2 models: one for combat (more detailed with bigger textures), and one for adventure map (the _LOD suffixes). In ToE, the new creatures use only the combat model. is the list of creatures. Each item is identified by a creature ID and links to the <Creature> file. There are 2 unused items in this list: CREATURE_SNOW_APE and CREATURE_BLACK_KNIGHT. You can use these slots to put your own creature instead. 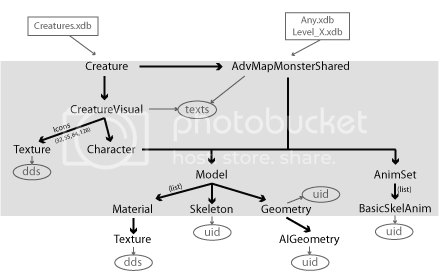 These files lists <AdvMapMonsterShared> objects, that can appear as random monsters, either when a level is specified (Level_X.xdb) or not (Any.xdb). As such, including the new creature in these lists is not required for it to be usable, only to give it a chance to appear when the mapmaker has placed a random monster on the map. This has been a long post, even if we skipped many details. It should at least give a basic idea of what files are needed to package a new creature. Of course, it only makes sense if you look through the files at the same time. There is still one issue I should say some words about though: how to place the creature on a map with the map editor. the last one is a better one,how about bluing it off. If you want for people to be unable to lower it's defense, probably going to have to add armored. Maybe a few magic resistences? Logical ones for crystal at least. Fire and ice perhaps? Not immunity, maybe even just damage reduction. Theoretically it would be immune or highly resistant to light also. I dont think you can be immune to light unless you have general immunity. "Am i a demon? No im a priest of the light! THE BLOODY RED LIGHT"
Edited by WarLore at 10:37, 23 Dec 2007.
looks great.have you added any abilities yet? Edited by InfernoX880 at 01:14, 25 Dec 2007. Comment now while I can still change! EDIT: And I've finally finished . Here is the shot. I'm guessing that from this angel, very few of you will notice the problem with its feet. *EXP value is based on one of my MODs that changes EXP per killed creature. If you think it's too high, you can easily change it yourself. **This was a toughy. I had to give it some attribute as it was not a living creature. It was either Mechanical or Elemental (too bad there is no Arcane type creature). elemental sounds better than mechanical,cost you should chance to 10k and 15 crystals or less.also could be more useful if it had immune to magic. What immunity were you thinking of? Remember also that as an Elemental being it gains certain immunities. Hey dudes, crystal isn't red! Crystal is translucent and if you have lot's of it- it become white-pale blue- somewhere a bit violet. How exactly is luck a skill? If you want to get really geological, crystal can be defined as a category rather than a specific mineral. In modern society it is frequently so. By this I mean that a lrge percent of the population thing a diamon and crystal are the same thing. For this reason, many people have various interpretations of crystal, none of which are accurate save for those who draw crystals as you said. I however, keep to the tradition of the dunces who decided to make red crystal dragon (like I said, large percent of the population, so the one guy on the board who was like, "Hey, that's not right," probably got fired) from Heroes 3. Let's be honest, do you want a real crystal dragon, or do you think the red one is cool? I'm also trying to figure out how to do transparencies, but no luck so far. Thanks. I guess I'm finally geting the textures right.